Gyuman mutters that she sure is busy these days, switching from lawyer to prosecutor and what not. 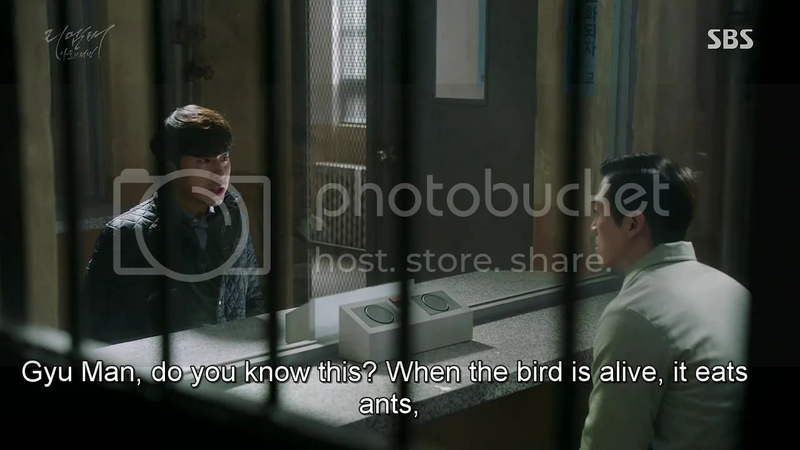 In Ah brings up Jaehyuk’s second trial and that his fingerprints were found on the murder weapon. 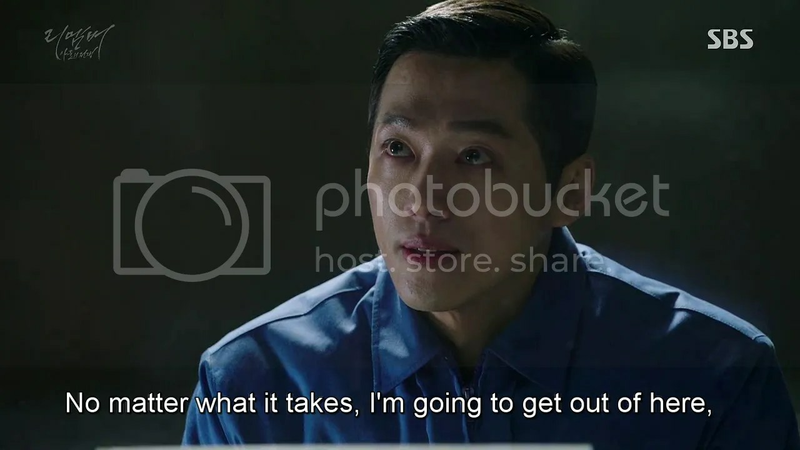 Gyuman couldn’t care less exercising his right to keep silent until Hong Moosuk arrives. Dongho, and Sangho sit with Soobum asking him what he’s going to do now. 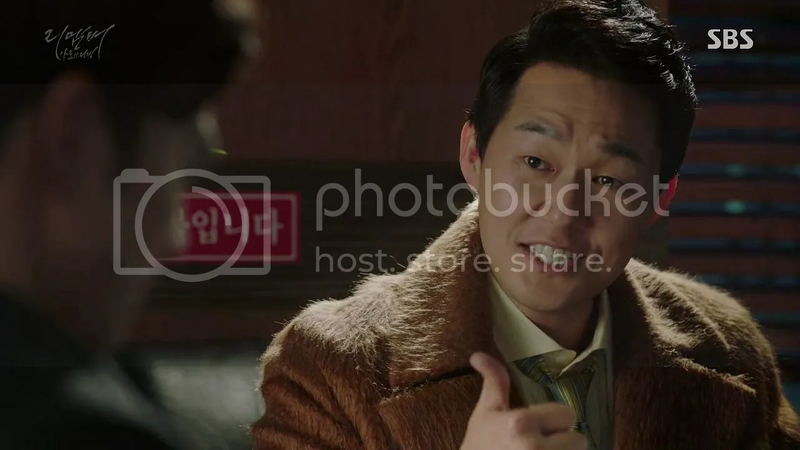 Soobum plans to turn himself in, which Dongho approves of, as he did have a major part in covering up Jaehyuk’s murder. Soobum says he plans on paying one last visit to Gyuman before handing himself over to the police. 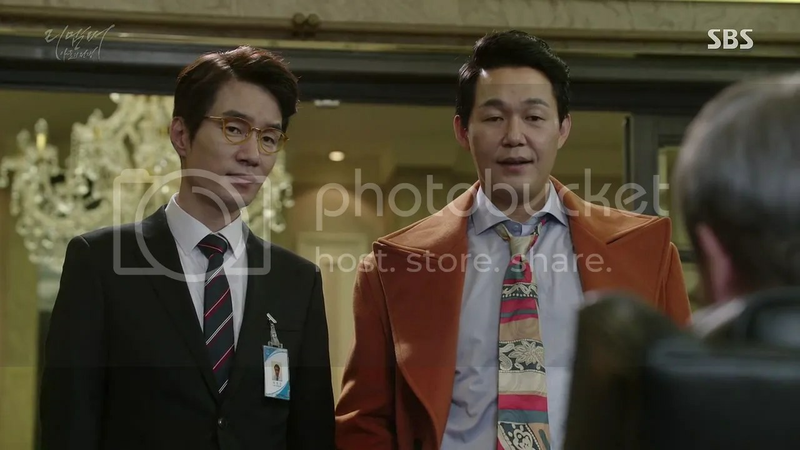 Meanwhile, Moosuk and Il Ho visit Gyuman (who’s in prison clothes once more). 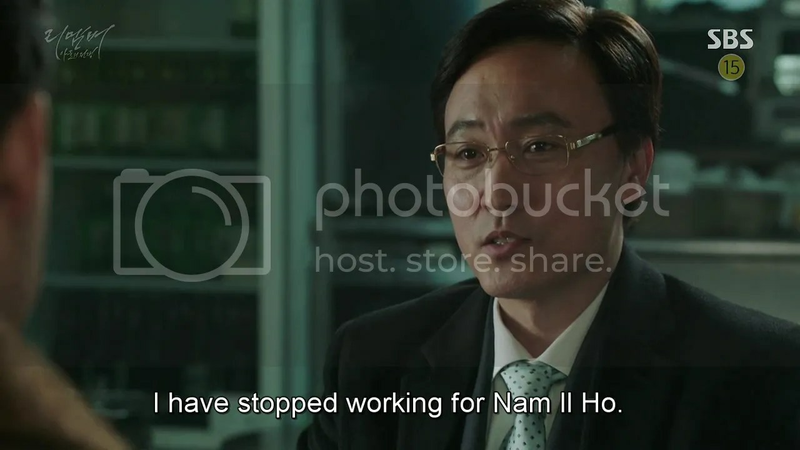 Il Ho admits to being the one who called the helicopter away (he clearly did this out of self-preservation as articulated in the previous episode but tells his son something else) because the prosecutor had moved too quickly. Moosuk chimes in that Interpol would have caught him even if he had gone to China by boat. Gyuman’s either too thick to get that Moosu double-crossed him or is biding his time because he just asks his father what’s going to happen to him. His father plans to use his political connections to get Gyuman out. Moosuk vows to to his best as well. (Maybe Gyuman does know something?) 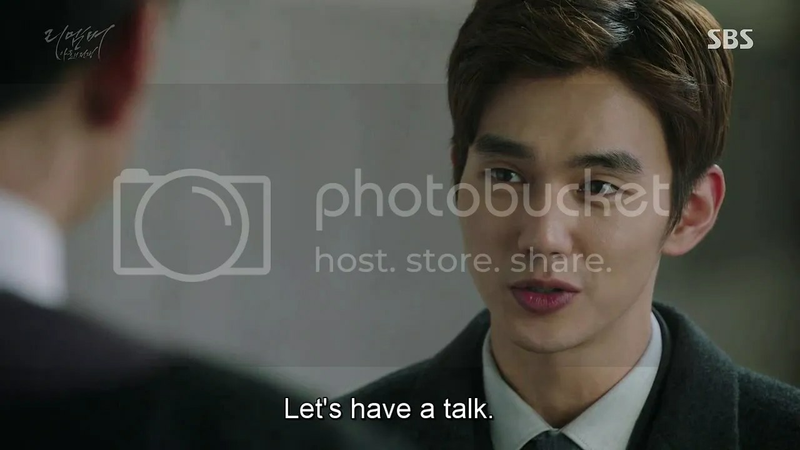 In Ah and Jinwoo discuss the possibility of Il Ho pulling strings, given that he thinks himself above the law. Their plan is simple. But they know that Il Ho won’t let it go that easily. And they’re quite right as Il Ho calls the Deputy Minister over for dinner. 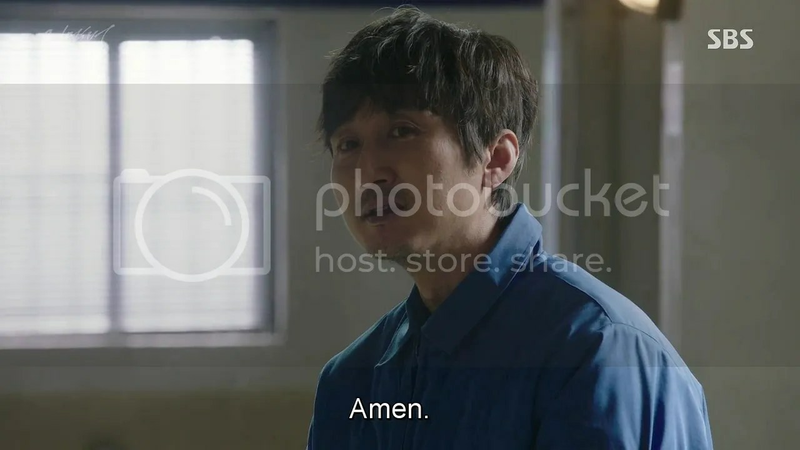 Yeokyung strides in once the call ends and announces that it was she who tipped the prosecution off to Gyuman’s plans. 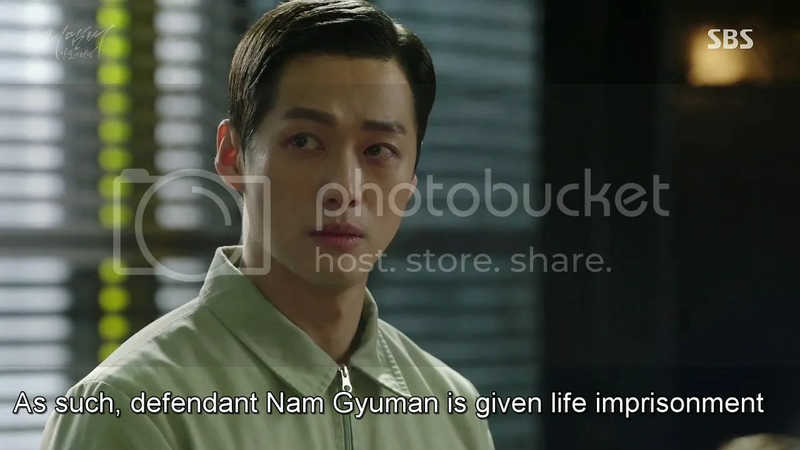 Il Ho asks who is she to judge if Gyuman should get punished, and Yeokyung answers and she was once a prosecutor too. She’s leaving the country but before she does there’s something she has to tell him. Burn. 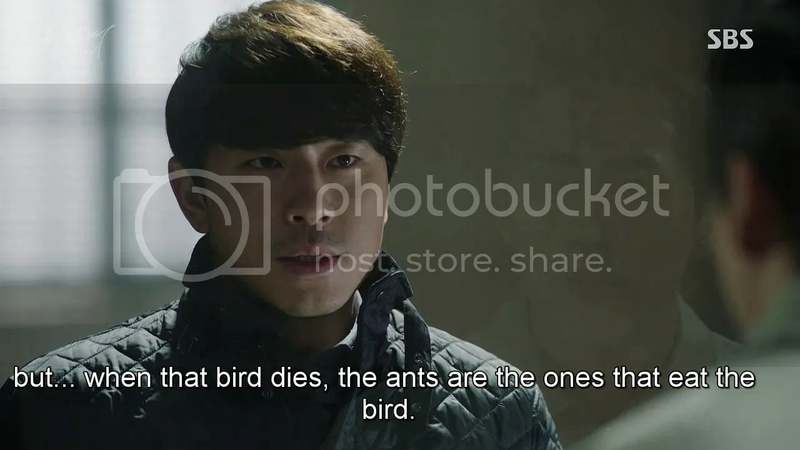 Jinwoo and In Ah discuss Gyuman’s final trial. He hands over a huge amount of financial data that proves Gyuman’s been dealing under the table and setting up paper companies. But if they plan on marking Gyuman as guilty beyond doubt, they need an additional witness. 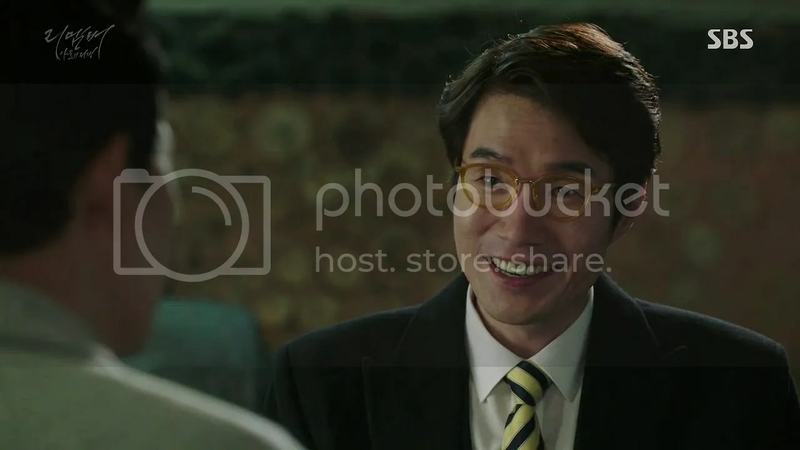 The other man in the video, Bae Chul Joo. 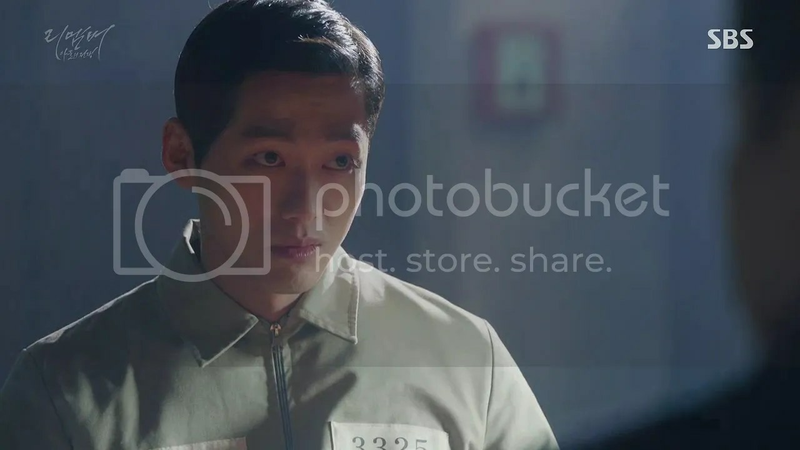 Jinwoo meets with him in prison and points out that he has fulfilled his end of the bargain. Gyuman’s in prison but he could just as easily get out. 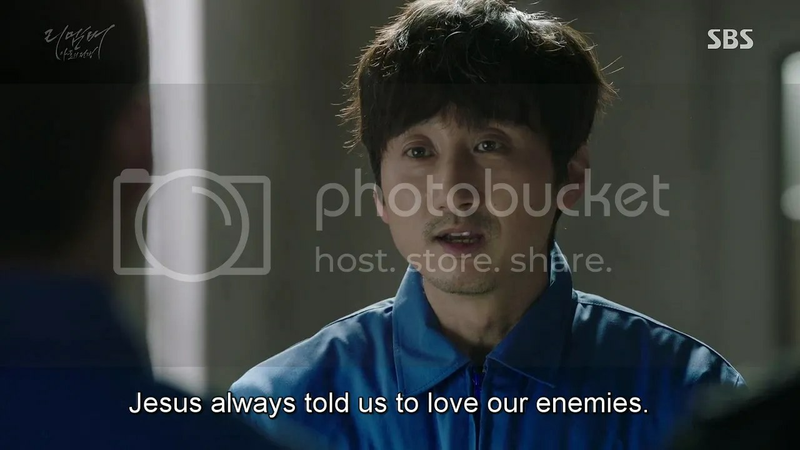 To prevent that, he needs Chul Joo to testify. 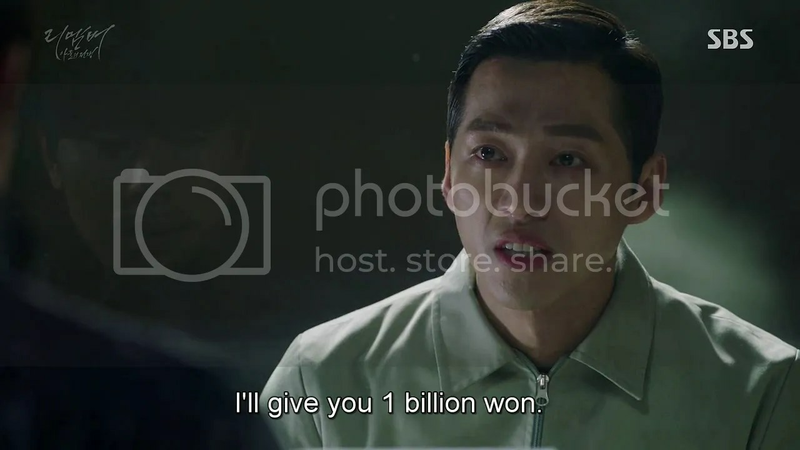 Il Ho and Moosuk sit with one Deputy Minister Jang and blackmail him (with all the money he’s received from them over the years) into switching the judge on Gyuman’s upcoming trial. Moosuk looks very pleased at the turn of events, which makes me wonder if he doesn’t have something more up his sleeve. 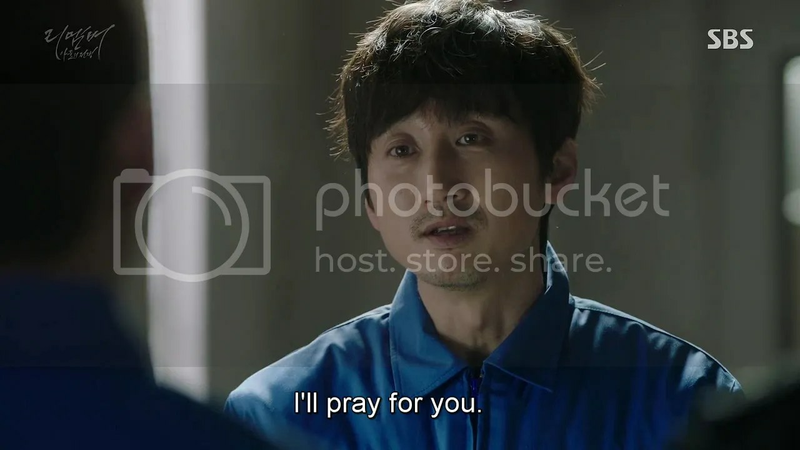 Soobum visits Gyuman in jail and I have no idea what sort of alternate reality gyuman lives in because, despite all he’s done to Soobum, he asks him to testify at his trial that everything he said before was a lie. He’s furious to hear that Soobum’s going to surrender. He tells him to live properly in jail; it’s his last bit of advice as a friend. 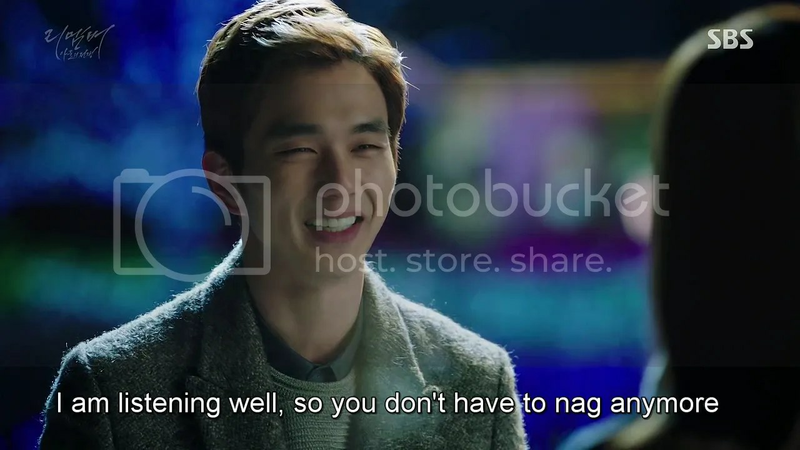 Gyuman takes no heed of the advice, choosing instead to focus on Soobum’s audacity to give him advice. Soobum says he discovered that it’s friends not enemies who make you lonely. He tells Gyuman he was quite lonely because of him and leaves. (It’s strange how human Gyuman can seem at times) Onto the trial the next day, people protest in front of the courtroom when Gyuman’s lead out. He finds the whole thing rather hilarious at first until someone starts throwing eggs. HAHA. 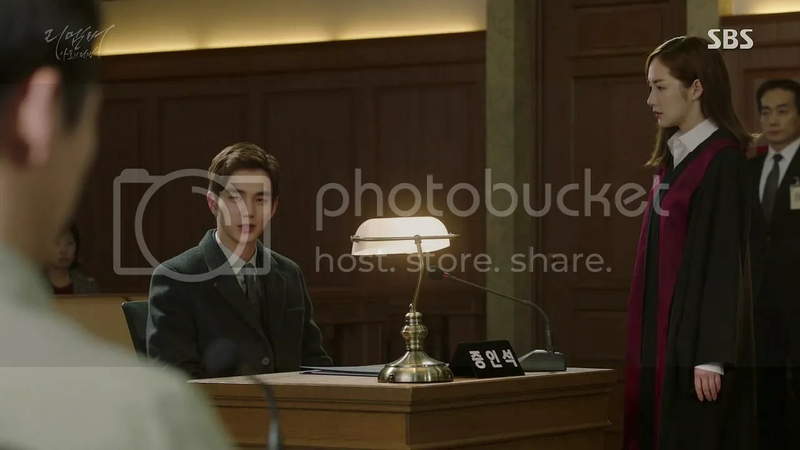 Jinwoo and In Ah meet in front of Lady Justice once more. (Aww!) 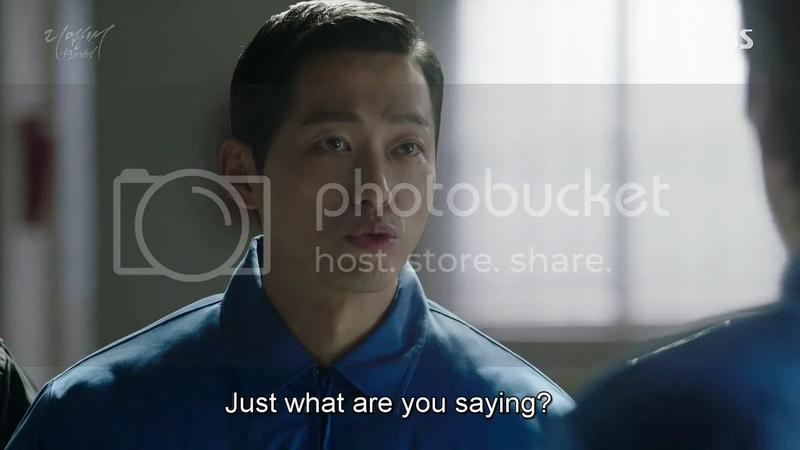 However, In Ah and Jinwoo exchange glances in shock, when a different judge enters the courtroom. A grinning Moosuk sits by Gyuman’s side. The latter’s recovered from his fit of pique and could not look happier. 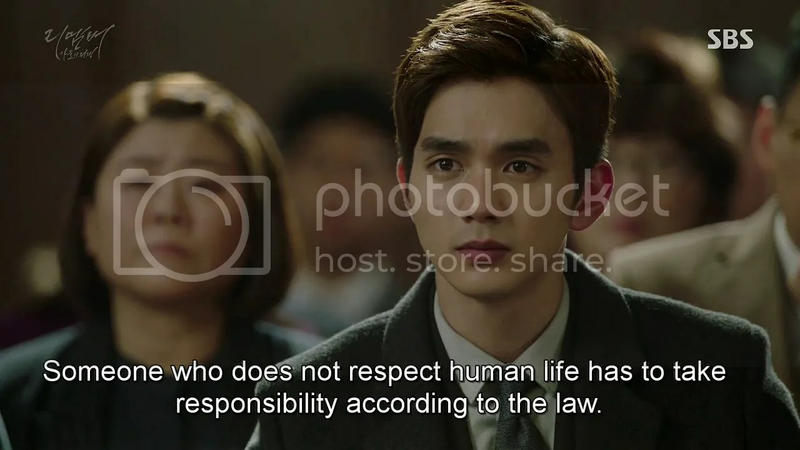 The judge’s first act is to dismiss Soobum as a witness saying that he recently had a quarrel with Gyuman and left the company. As such, there’s a high chance of perjury due to his wanting to get revenge on him. In Ah’s shaken, especially when an audience member yells at the judge for playing on Il Ho’s side and gets dragged out of court. The judge orders a short recess. 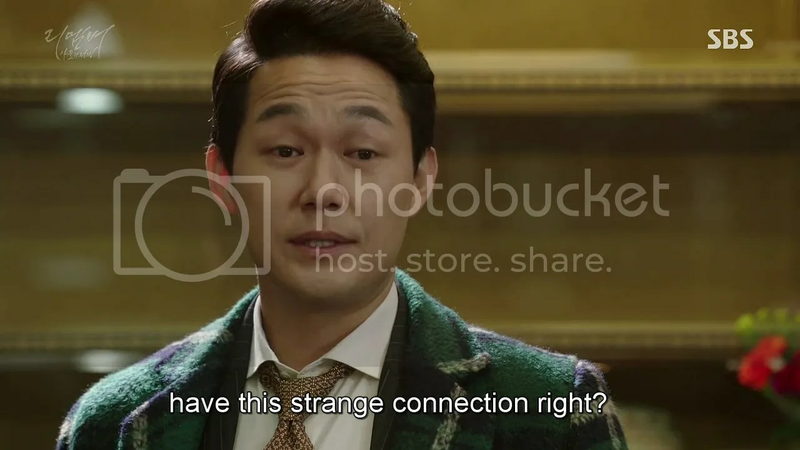 Moosuk and In Ah meet separately with him. She tries to convince him to accept Soobum but he stands firm while Moosuk gloats. In Ah throws both men a dirty look and leaves the room. 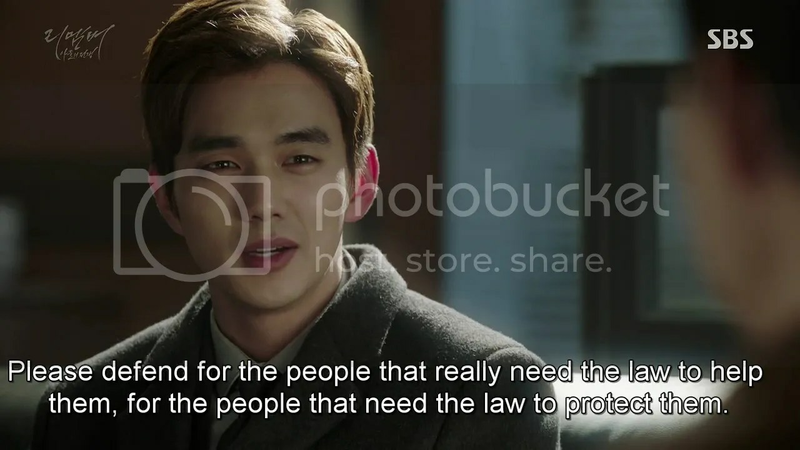 Moosuk asks the judge to take good care of the other witness as well. 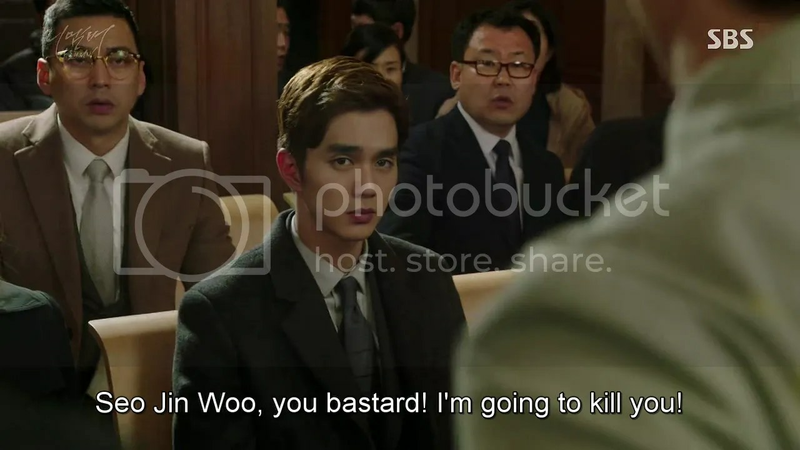 The judge leaves only to find his path blocked by Jinwoo. Once the trial resumes, In Ah summons her second witness. 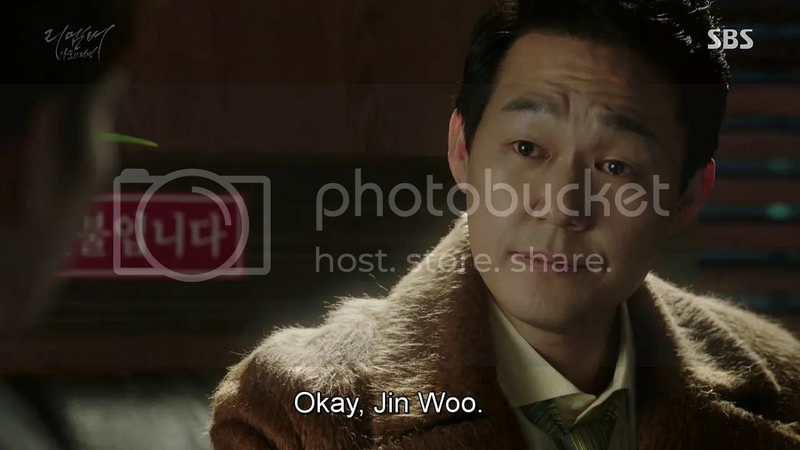 The judge casts Jinwoo a nervous glance before agreeing much to Moosuk and Gyuman’s surprise. 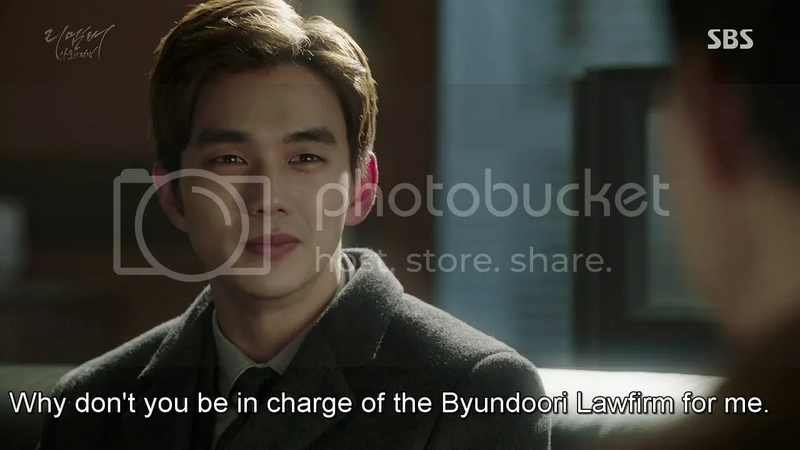 A flashback shows that Jinwoo was aware of the alliance between Deputy Minister Jang and the judge. 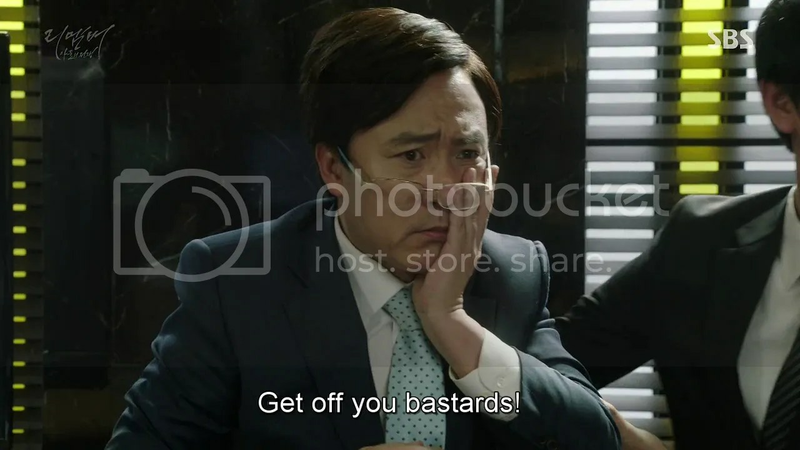 He shows him that Jang’s just made the news for being investigated by the prosecution on charges of bribery. He warns the judge that he should lead the rest of the trial fairly, if he doesn’t want to end up on the news himself. In Ah’s aware that Jinwoo must’ve done something and smiles gratefully as Kwak’s led in. 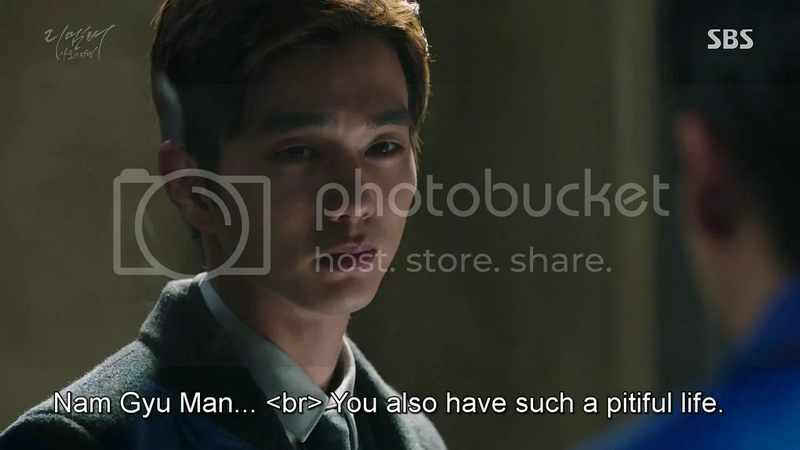 Kwak confirms Gyuman’s crimes including kidnapping and beating Jinwoo as well. 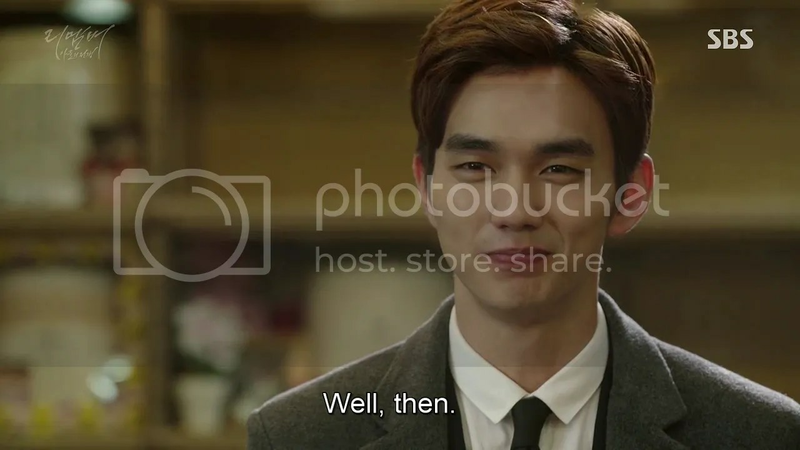 In Ah asks him if there’s anything else he’d like to say and Kwak simply says that he’s reflecting on his own crimes. 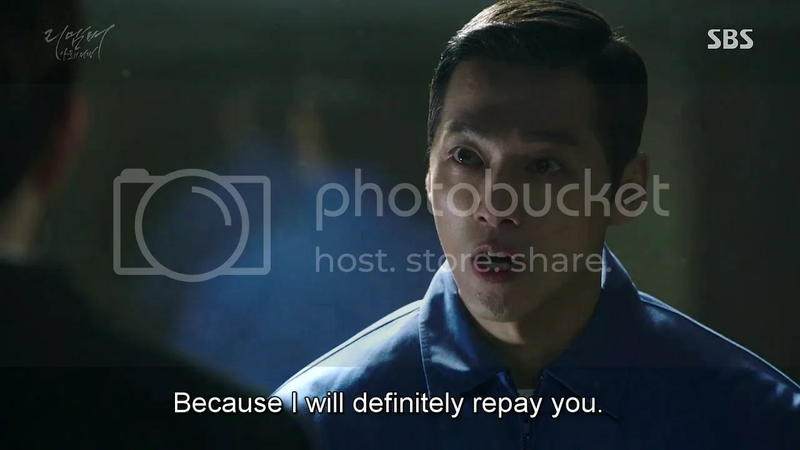 In Ah’s next bit of evidence is a letter from Bae Chul Joo. Moosuk objects but is overruled by the judge. 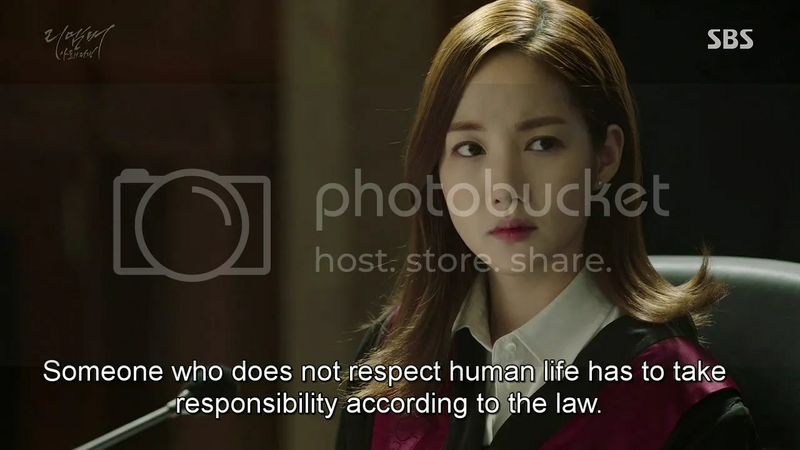 She then calls in the final witness to this trial, Jinwoo himself. 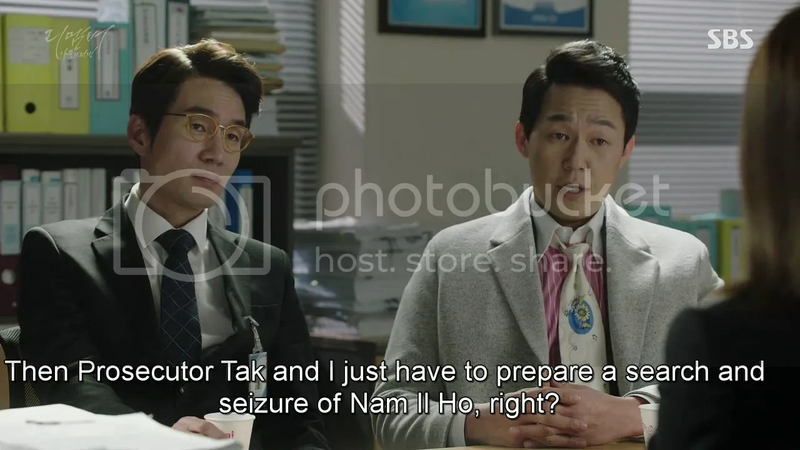 Moosuk jumps in once more saying that Jinwoo has Alzheimer’s, as such his testimony can’t be taken for fact but In Ah retorts that Jinwoo’s ability to testify hasn’t been impaired. The judge accepts him. 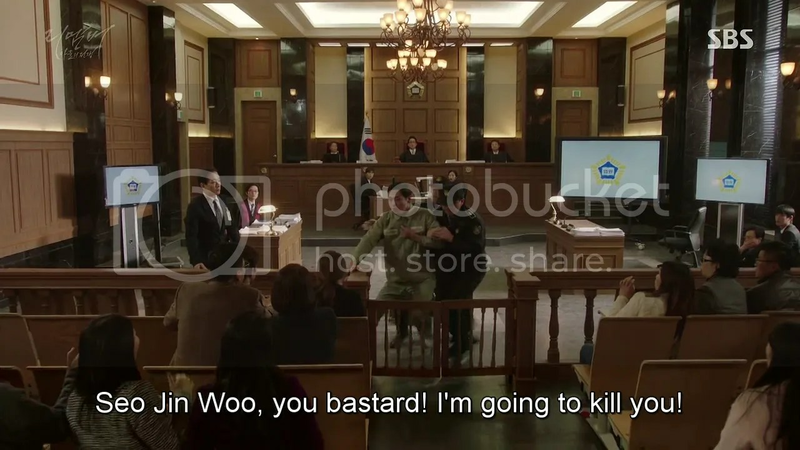 Sitting in the witness box, Jinwoo confirms that he’s been chasing Gyuman all this time to show how he framed his father for his murder. And without any remorse, he committed further crimes to cover this up. Jinwoo ticks them off. Assault, murder, illegal slush funds, bribery of lawyers and prosecutors, evidence tampering, drug usage. He thought himself above the law and saw no problem with trampling on the weak. 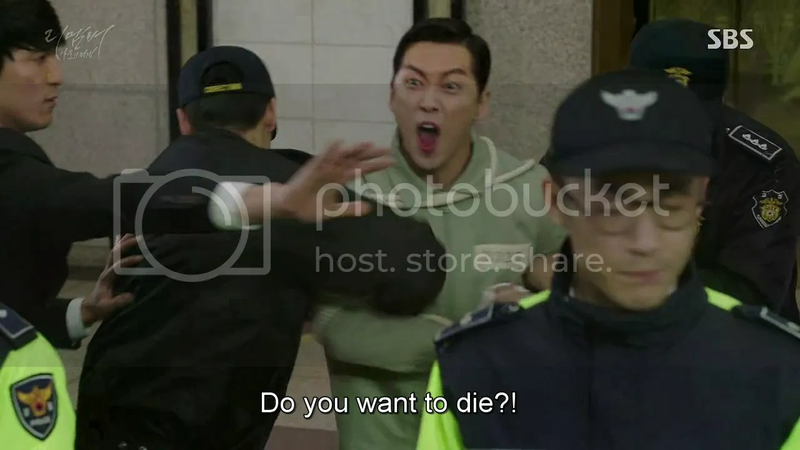 That gets a rise out of Gyuman who nearly throws himself at Jinwoo, but Moosuk restrains him in time. In Ah them hands in all the evidence they have to the judge. 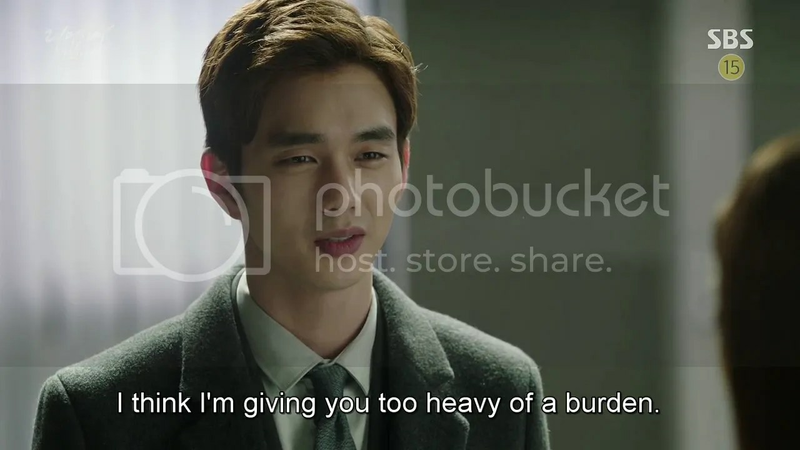 Il Ho’s minion reports to him that the judge accepted all evidence and two of the witnesses. Il Ho freezes in shock. Back the trial, the judge acknowledges that Gyuman assaulted Hayoung, that he murdered Jungah five years ago and that he committed numerous crimes between these periods. Jinwoo and In Ah tense up as the judge concludes his statement. YES! The court applauds as Jinwoo bows his head. Gyuman stands frozen in shock for a second before an insane smile curves his lips. 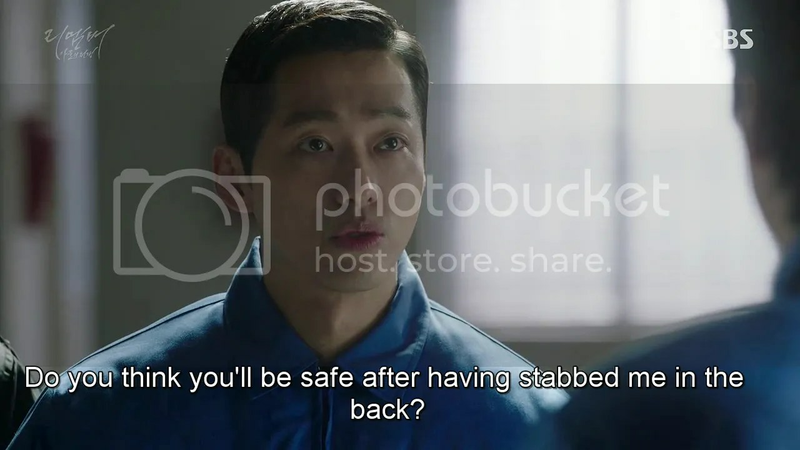 He tries to launch himself at the judge, gets stopped by Moosuk, punches Moosuk and makes for Jinwoo but the guards get to him first. He screams that he’s the law. He’s Gyuman, he won’t just stand for this, and is dragged out of the room by the guards. 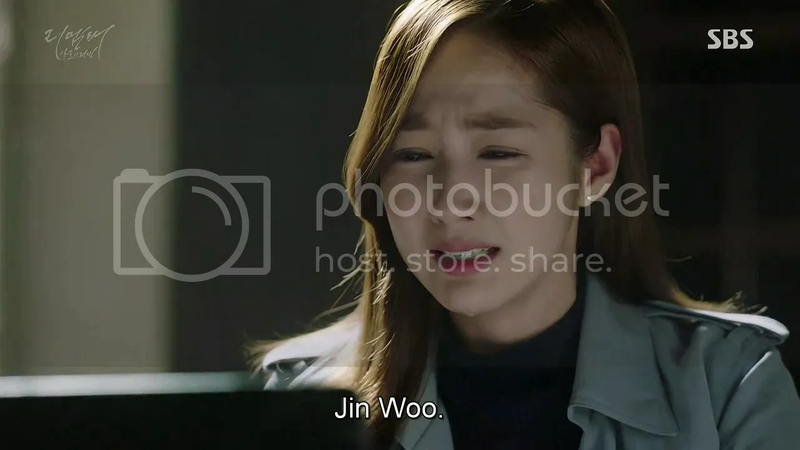 In Ah and Jinwoo exchange conflicted but relieved looks. 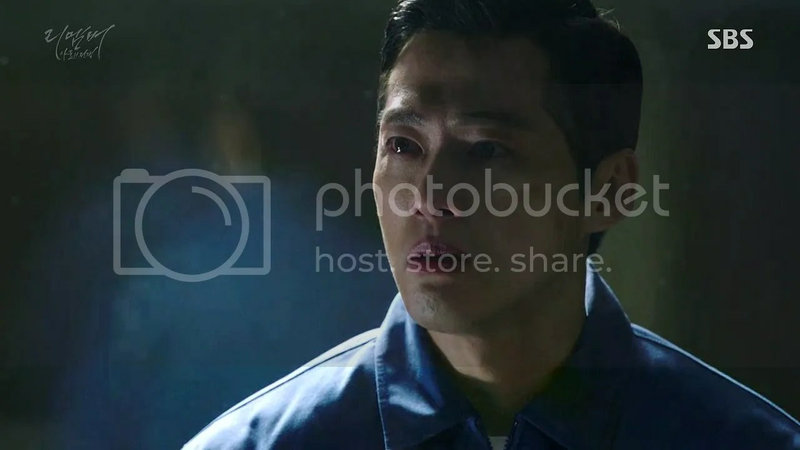 The next day, Soobum’s visited in jail by Seokgyu and informed of Gyuman’s arrest. He sighs that he thought he’d be relieved if Gyuman was imprisoned for life but some part of his heart hurts. 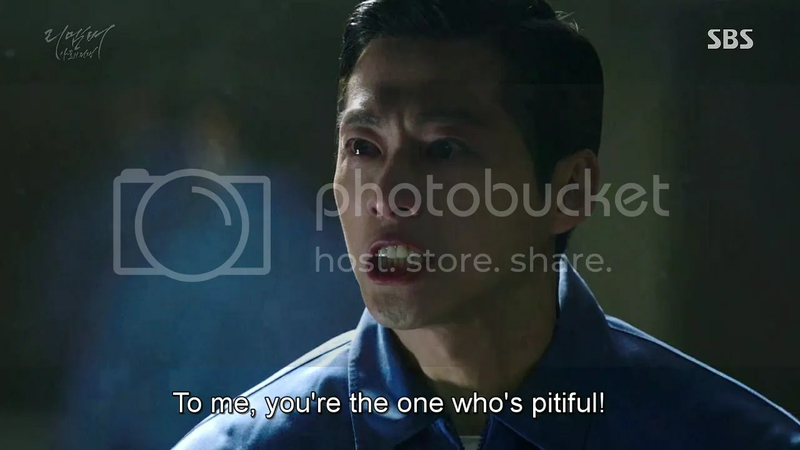 Seokgyu says it’s because they were friends at some point, and that some part of him hurts at seeing both of them in prison too. Soobum sighs sadly that he liked it most back when he didn’t care about money. He misses those carefree times. Seokgyu nods in understanding. Back at Byundoori law firm, Hayoung sincerely thanks In Ah and Jinwoo for all they’ve done. She gifts them with a pair of hugging monkeys and wishes them all the best. She plans on starting as an actress from the very beginning. In Ah thanks her in return for all her help and pats the pair of monkeys affectionately. Gyuman runs to the prison doctor to having gotten something in his eye. The doctor recognizes him and gets pissed when he starts throwing a tantrum and kicks him out. Gyuman’s being dragged away when he meets Kwak, who’s carrying his Bible as usual. HAHAHA. 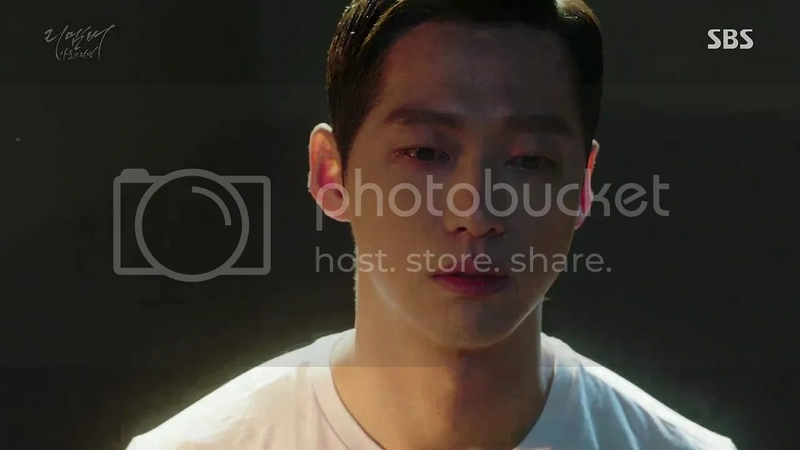 Gyuman’s next visitor is Jinwoo who says that he’s here to ask him something for the last time. Gyuman laughs, saying that he won’t be able to remember him soon. 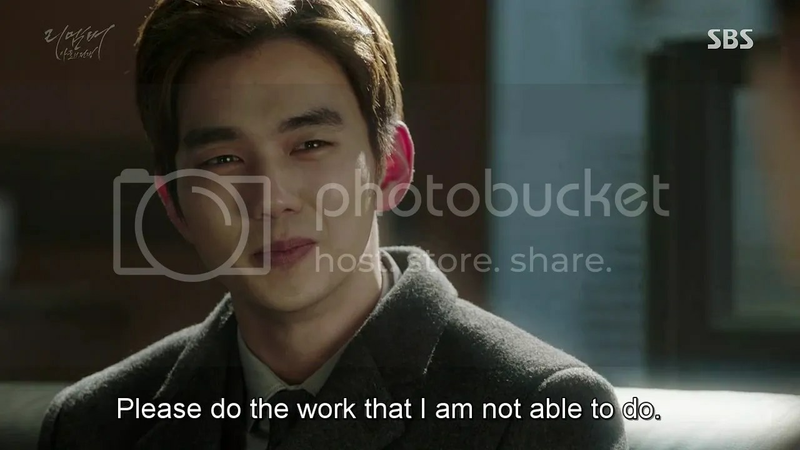 Jinwoo asks why he ruined his and his father’s life but Gyuman says it was just their fate. Just as well, Jinwoo gets up to leave, given that it’s now his fate. He’s stuck in jail forever. Gyuman stops him before he leaves. (Whoa, that was actually pretty sad). Jinwoo’s next visit is to Dongho (is he saying good-bye? You can’t, Jinwoo! Don’t!) Dongho asks how he feels and Jinwoo echoes Soobum, saying that he thought it would be a huge relief but it just feels empty now. He tells Dongho that despite the different paths their lives took, they sure were the strangest sort of comrades and gives him the first real smile in a while. Dongho smiles back saying that all that’s left is Jinwoo’s treatment and he’ll ensure he has the best doctor in Korea, but Jinwoo pauses. He asks Dongho to pretend he doesn’t know him, once Jinwoo no longer recognizes him. (WHAT?) 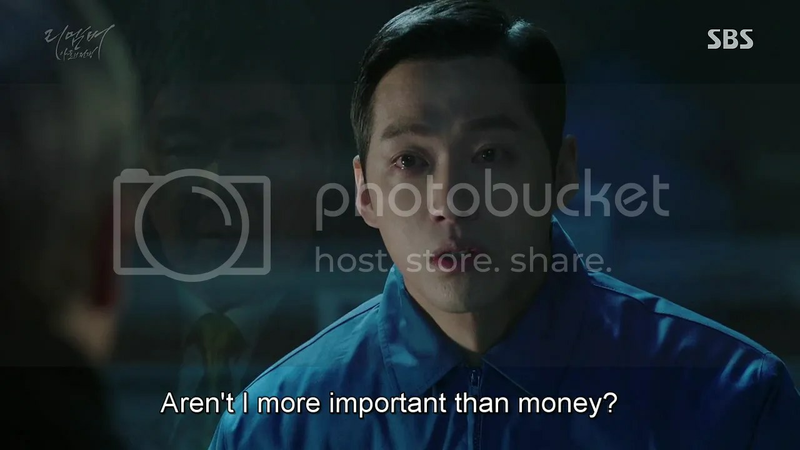 Dongho asks why. Jinwoo says that it’s because he has more memories he wants to forget with Dongho. Before he loses his memories, he has one last request. Dongho promises to do anything. 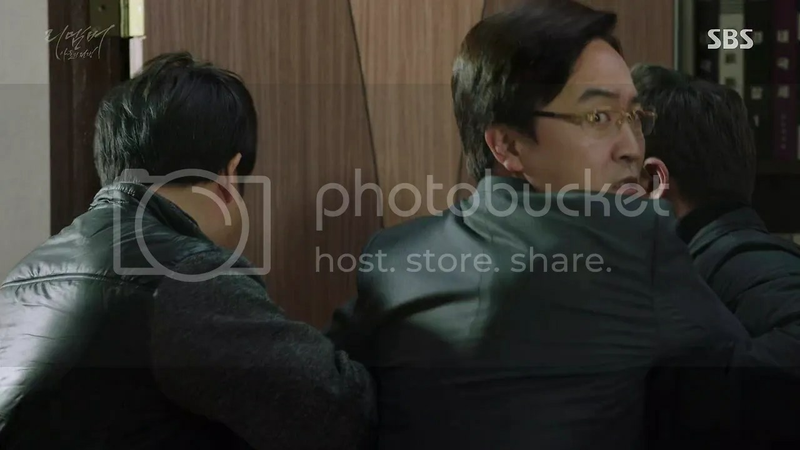 Il Ho visits his son in prison. Gyuman pleads with his father to get him out but Il Ho’s more focused on blaming him for Il Ho Group’s destruction. Gyuman promises to salvage it if he gets him free but Il Ho no longer cares. (Gyuman-ah, you’re thinking of the wrong kind of family. 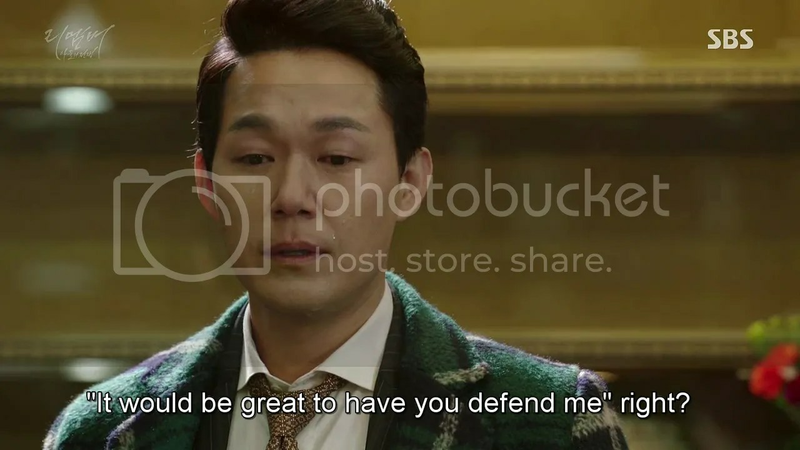 That was Jinwoo’s family, not yours) Il Ho merely gets to his feet and says what Dongho warned Gyuman he’d someday have to hear: someone useless should be thrown away. Gyuman begs uselessly as his father leaves, finally breaking down. 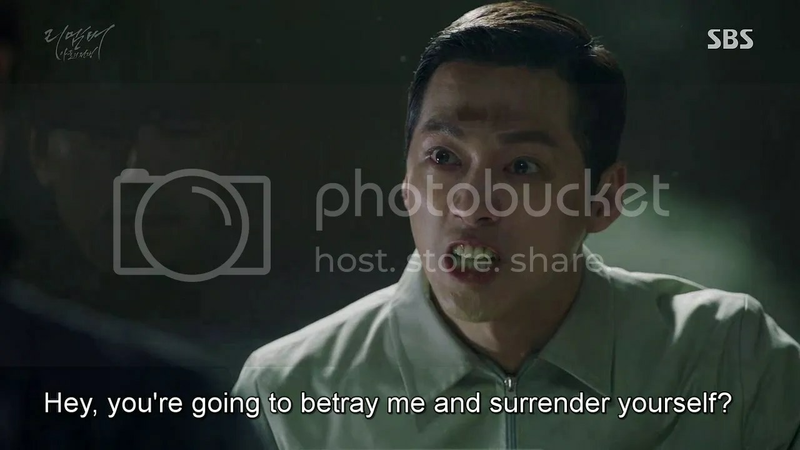 Il Ho takes his anger out on Moosuk who promises that he knows someone who can save Il Ho Group. Cut to him sitting with Dongho. 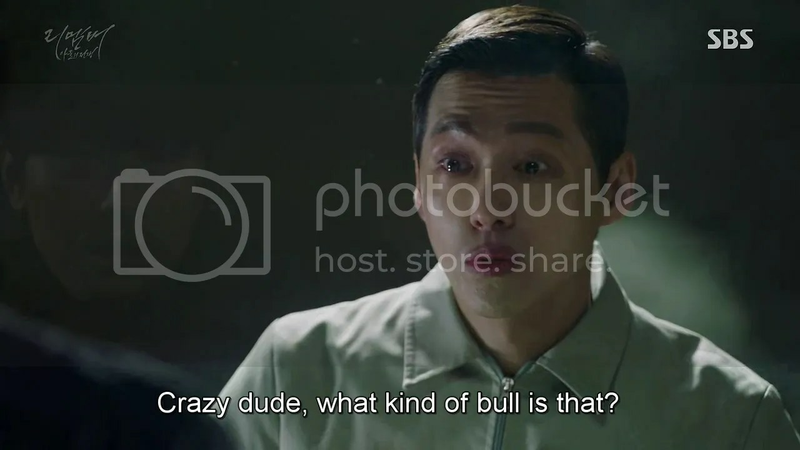 Moosuk notes that Dongho was aware of his duplicity anyway and asks if they’d like hiss help in bring down Il Ho group (as condescending as ever, this fellow). 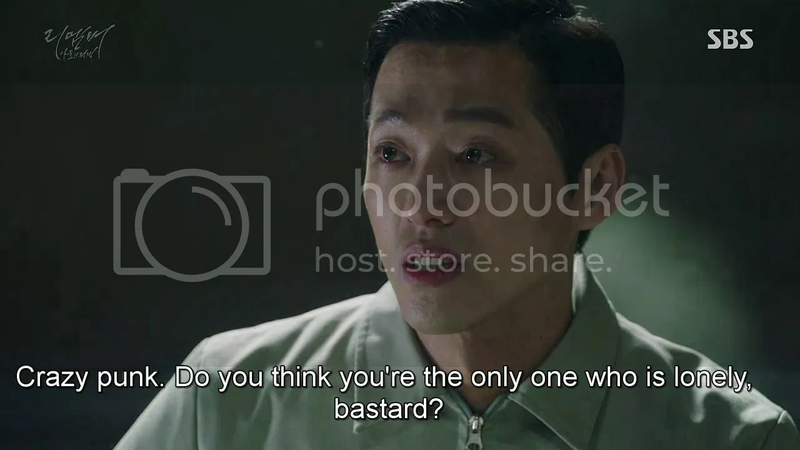 Youngjin snorts that they’ll do just fine thank you, without his help but there’s no denying that there’s no one who knows every inch of Il Ho like Moosuk. Dongho and Youngjin discuss it later and Youngjin is especially irked at the fact that Moosuk could leave scot-free. But Dongho has a plan. 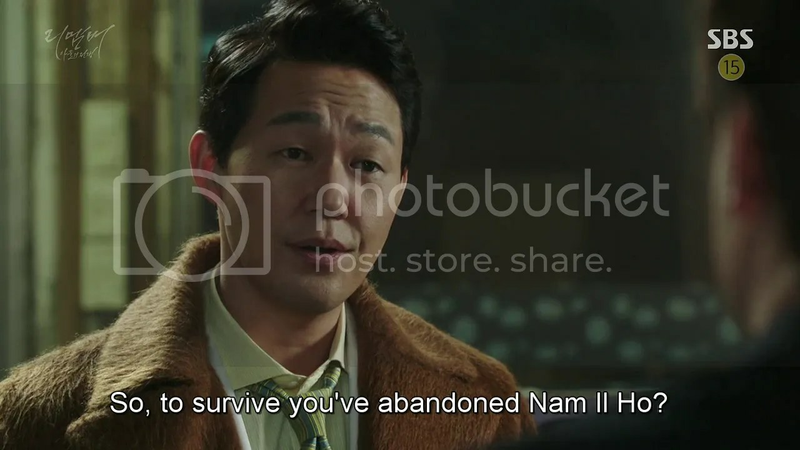 The next day, prosecution shows up at the Il Ho mansion, to Nam Il Ho’s shock, and raid it despite his protests. 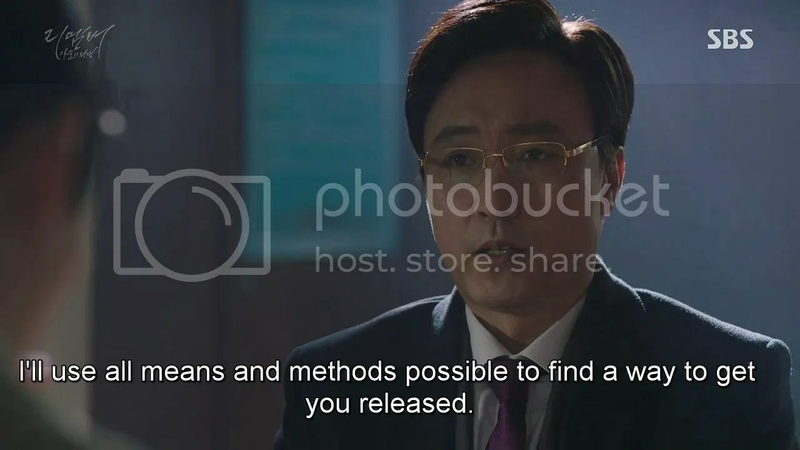 Youngjin says he’s also under arrest for murder (the Seo Kwang case) and gets his officers to retrieve the very evidence he handed over (Dongho’s cassette tape) during his tenure at Il Ho, from Il Ho’s own safe. Okay that’s clever. Dongho joins him to gloat, saying that he did promise to get father and son in jail. 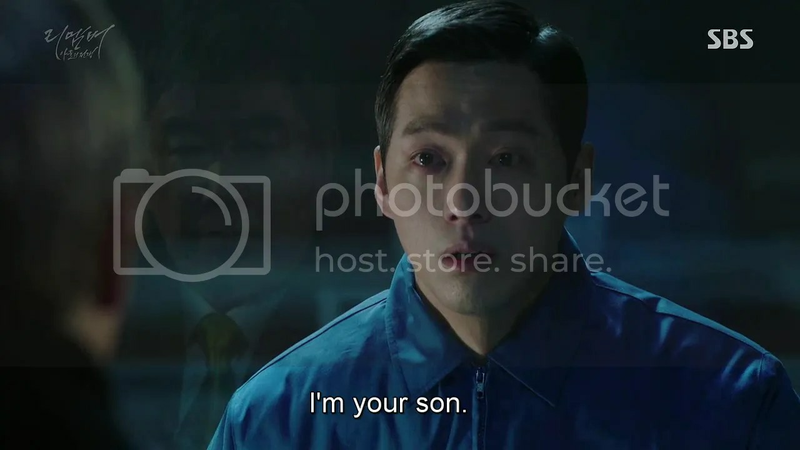 Speaking of the son though, Gyuman sits in jail, remembering when his father appointed him as President of Il Ho and how proud he’d seemed of him (these flashes of humanity really are strange, because you can see how much Gyuman treasured that moment, though Jinwoo’s father had just died). 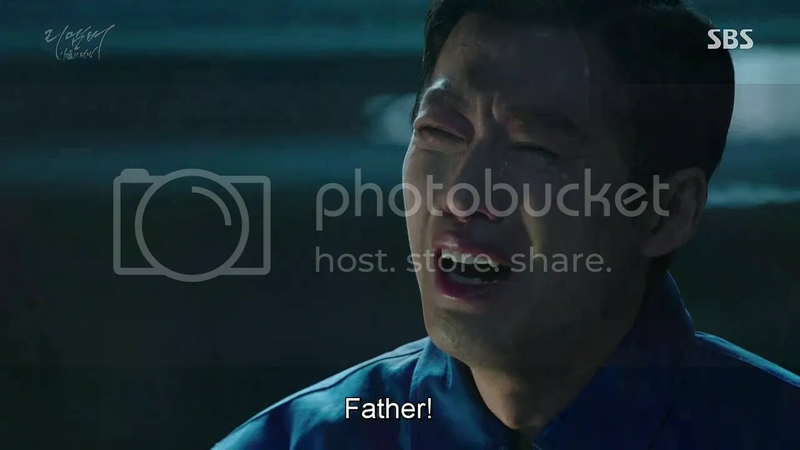 He thinks back to Dongho saying that his father abandons everyone, being his son doesn’t make him exempt to that rule, and finally he recalls his father disowning him. Rising to his feet he drags the chair over to the bars of the window and ties his shirt around it in a loop. 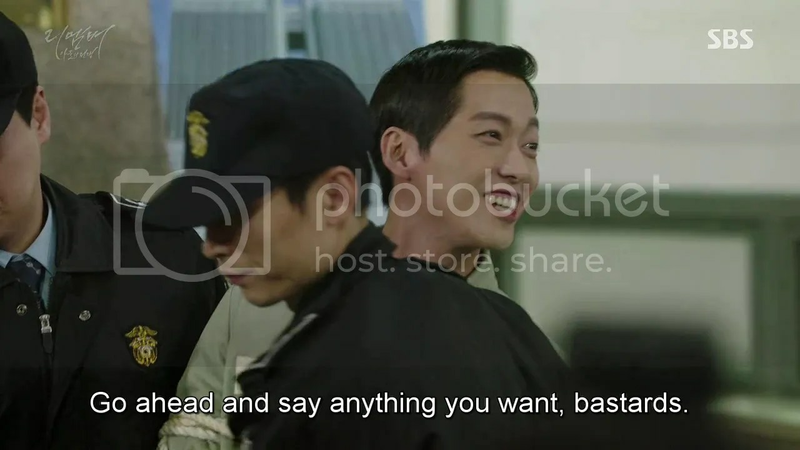 (Nam Goongmin is playing the hell out of this scene). He hangs himself. The chair falls to the ground. His father receives the news the next day and opens his mouth in a silent scream as he starts to sob. The news spreads like wildfire and Dongho and Jinwoo hear of it. 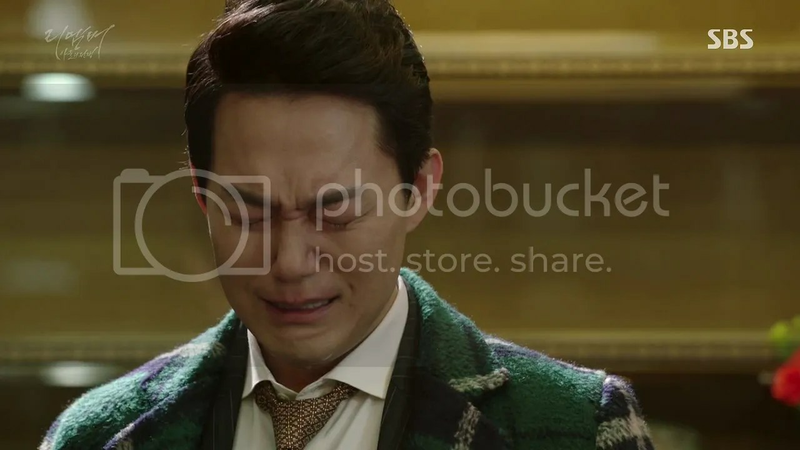 Lawyer Yeon sighs that Gyuman only ever took the easy way out. Jinwoo withdraws into his hidden room. In Ah follows. They stand together, staring at Gyuman’s photo on the wall. Il Ho calls Moosuk who red buttons him away, smiling greasily at the head of the new conglomerate he’s joined (ugh, he’s disgusting). 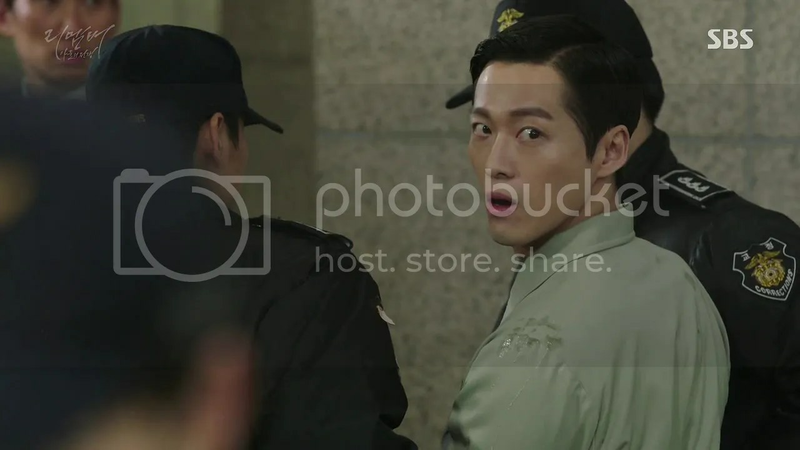 Il Ho tries again but Youngjin arrives with a warrant for his arrest. He says that Gyuman’s death is a shame but this was all due to Il Ho’s greed, so he might as well pay properly for his crimes. Dongho and Youngjin meet up for drinks, watching news footage of Il Ho (in a wheelchair, lol, he never quits) being brought in. Youngjin, for one, is over the moon. Jinwoo and In Ah walk through the field she called her thought-organizer in a previous episode. Jinwoo surprises In Ah by saying that he’s quitting being a lawyer. He was only one for his father, and he’s done all he needs to do. Plus, he says with a smile, it looks like he’s going to have to rest for a bit. 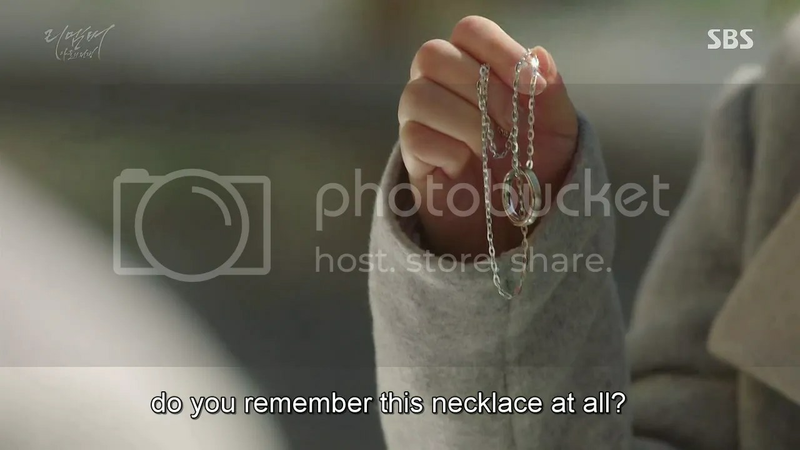 Jinwoo flashes back to her handing him his necklace after that first trial, running to his rescue with nothing more than pizza and a heavily-shaken bottle of Coke, and cleaning the graffiti outside his home. Aw! (THIS BETTER HAPPEN SHOW) In Ah returns home to find her mother reluctantly ready to talk. 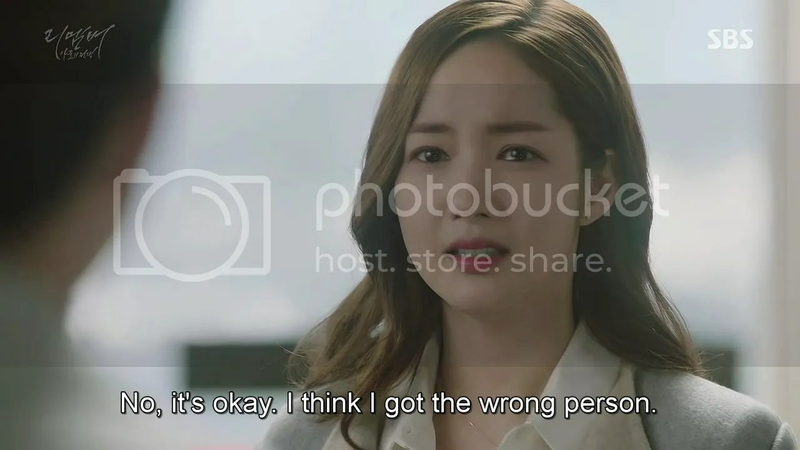 She asks if In Ah can really handle Jinwoo condition and shakes her head at In Ah’s stubborness wondering who on earth she takes after to be likes this. In Ah laughs saying that it’s her and her mother sighs, slightly warmer now. Her father joins in, relieved to see things all well between them. 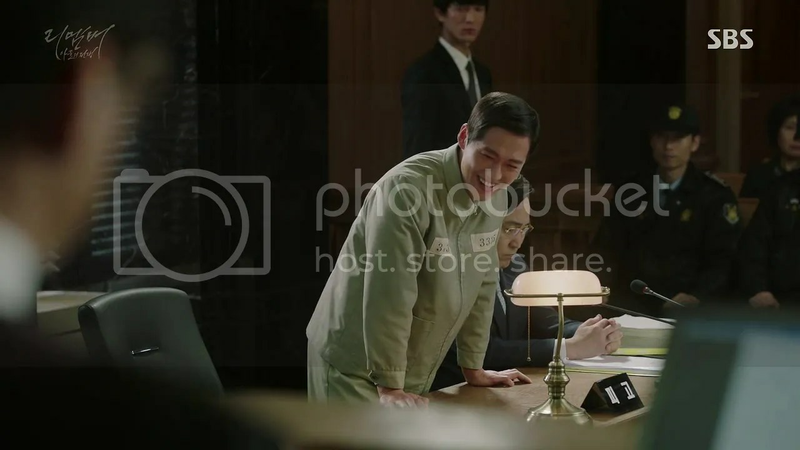 The next day, Moosuk’s already hard at work at his new job when In Ah comes barging in placing him under arrest for everything from bribery to Seok Joo Il’s death. Moosuk’s new employer washes his hands of him immediately. In Ah asks if Moosuk really thought he’d be the only one to get free. He’s an insult to the profession and she plans on keeping very close watch on him and others like him. 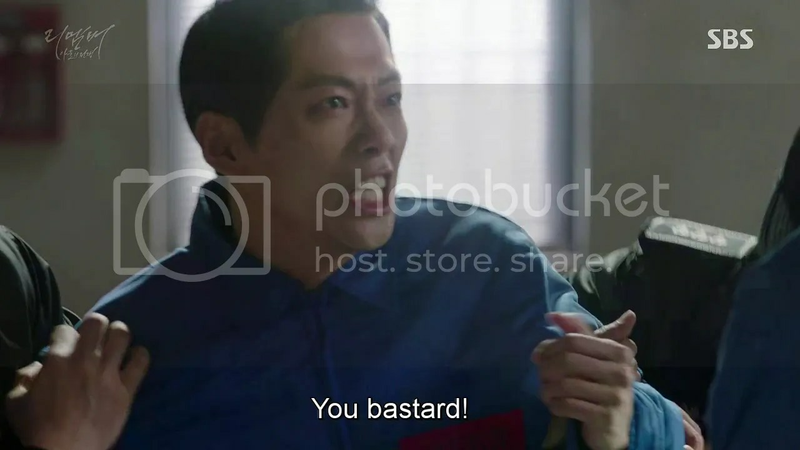 Quick flashback to Youngjin giving her all the evidence, saying that she’s really the only one with the right to arrest Moosuk. In Ah happily does so. 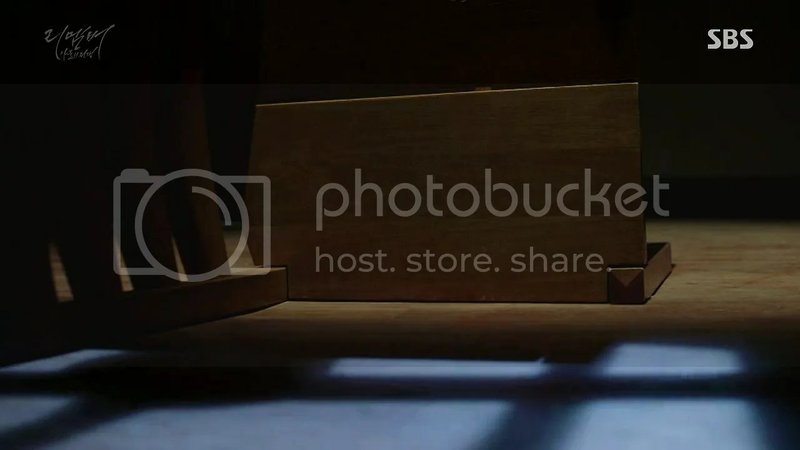 Jinwoo stands in front of his father’s ashes at the charnel house. He sadly says that they could have lived happily together for a while. Gazing at his family portrait, he sighs that he misses them all. 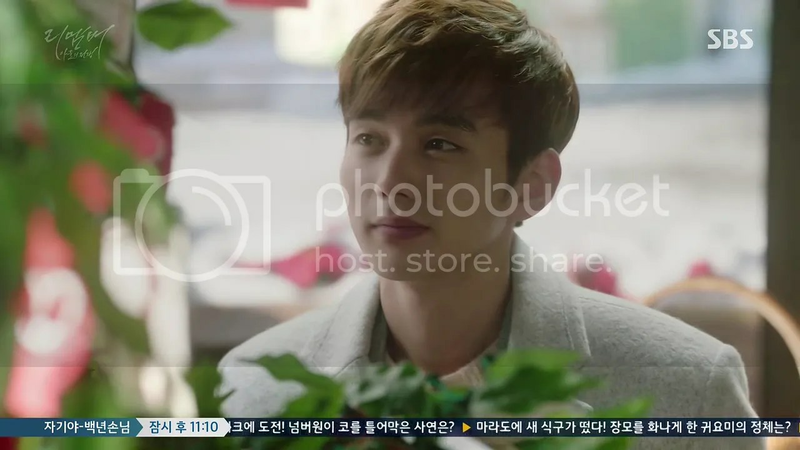 Dongho comes in to pay his own respects to his father and sees Jinwoo. He calls over but Jinwoo simply stares and asks him if he knows him (NO!) 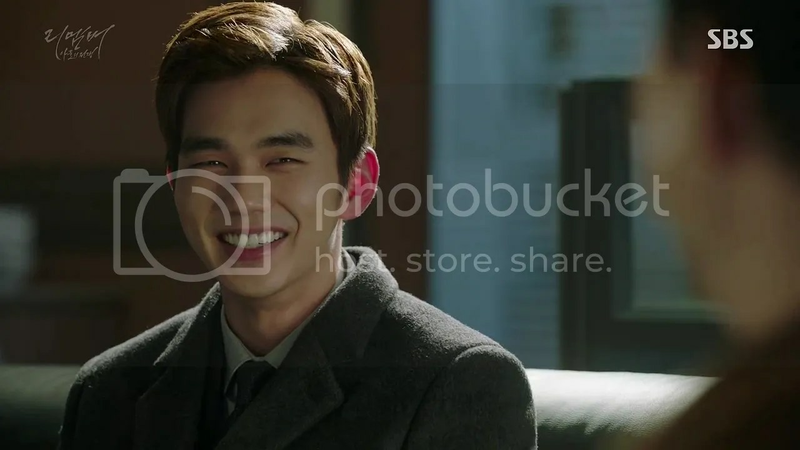 Dongho stares dumbstruck while Jinwoo flashes back to when he first saw Dongho at the charnel house, proudly showing his father that he’s a lawyer now. 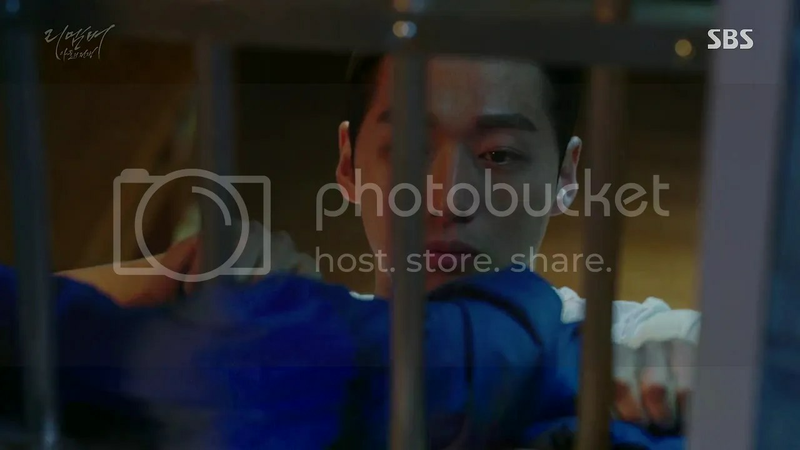 Jinwoo nods, saying he recognized him from back then and Dongho fights back tears saying that they saw each other around the charnel house, having both lost family members on the same day. Jinwoo wonders at the strange coincidence. Jinwoo nods and smiles, pausing on his way out. 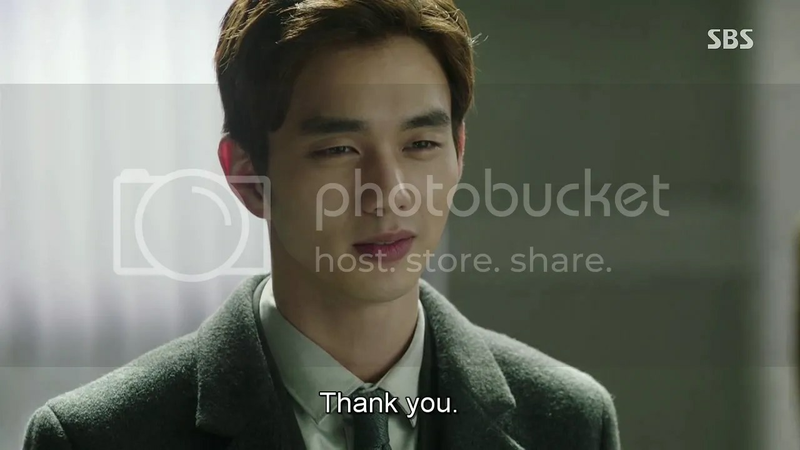 He asks Dongho if he knows what the best compliment one lawyer can give another is. Back at the office, Jinwoo takes out two notebooks: a white one titled ‘Memories I want to hold close’ and a blac one titled ‘Memories I want to forget’. He tosses the black one into the fire, holding onto the white one for a while. In Ah arrives at the office the next day to find it empty. 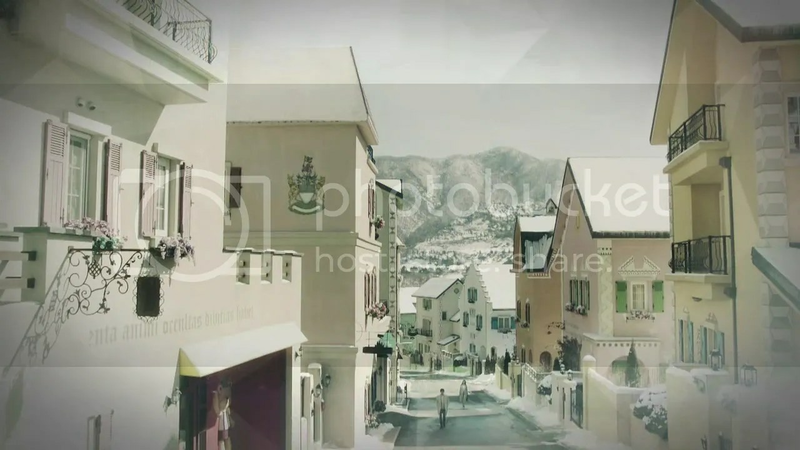 She races to his hidden room to find it empty, even the pictures on the wall are gone. But the hugging monkeys Hayoung gifted them are on his table with the necklace she gave him during the trial on them. There’s a laptop there with a note that say ‘For In Ah’. She sinks down and plays the video. Jinwoo awkwardly begins. Jinwoo: In Ah, if you’re watching this video, then my memories are all gone. I thought a lot before making this decision so please don’t be hurt. In your actions and eyes and heart, I saw how much you wanted to be by my side. Jinwoo: Please make loads of happy memories and be happy. Even if I forget everything, I’ll always remember you. Slumped over the desk, In Ah sobs. 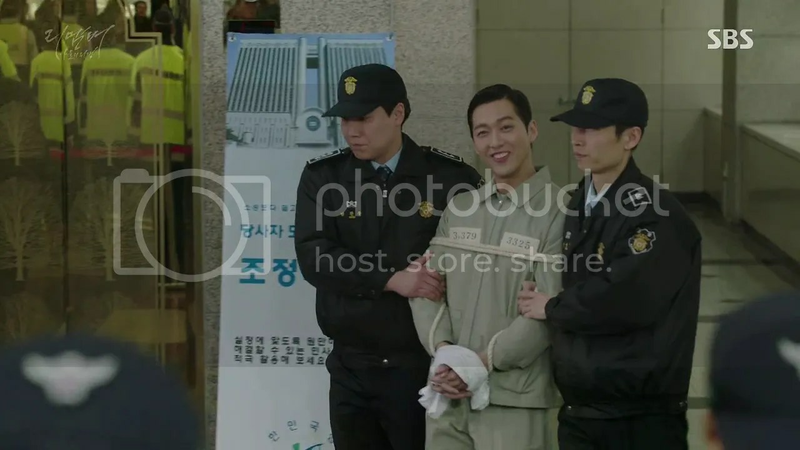 Dongho’s in court, defending a poor old lady. 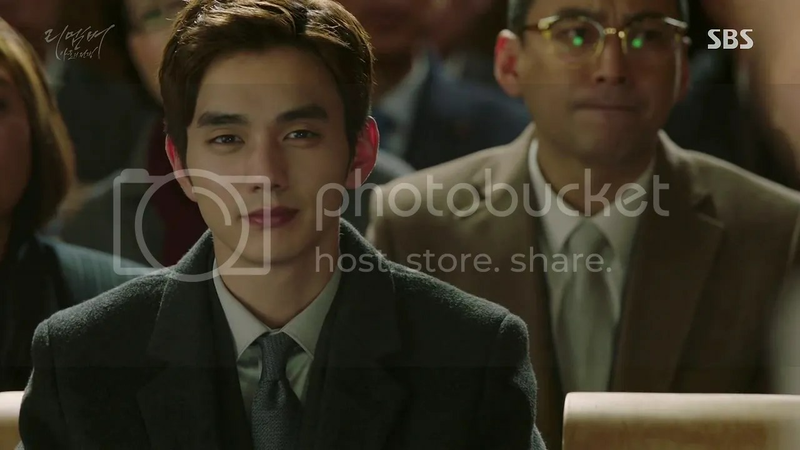 Seokgyu presides over the case, handing over a fair verdict. Ahn Soobum’s in the audience, apparently having gotten out early on good behaviour. 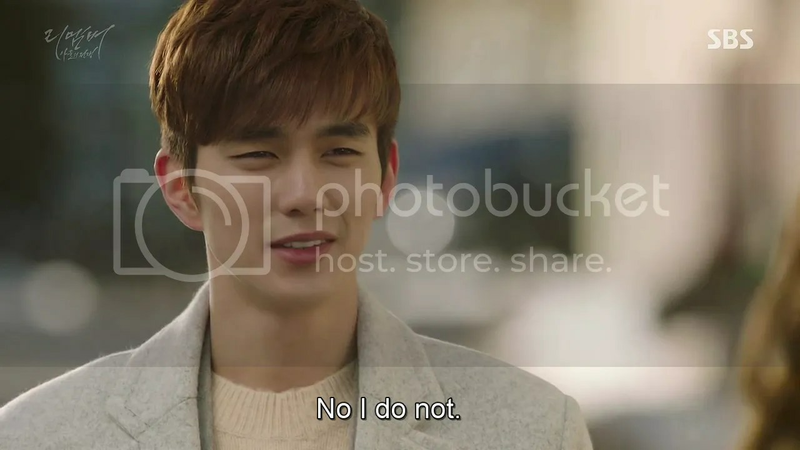 The two have a chat after the trial ends, with Dongho back to his wise-cracking self, when In Ah appears. Seokgyu asks her if Jinwoo’s contacted her, to which she ruefully shakes her head. Dongho sighs that he vanished liked the wind, not wanting those around him to suffer. In Ah nods with a sad smile. 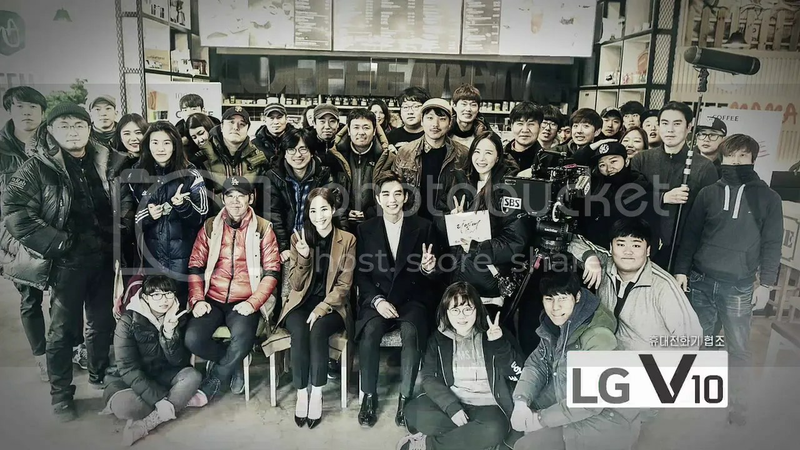 The lawyers celebrate back at Byundoori, where Dongho now works! 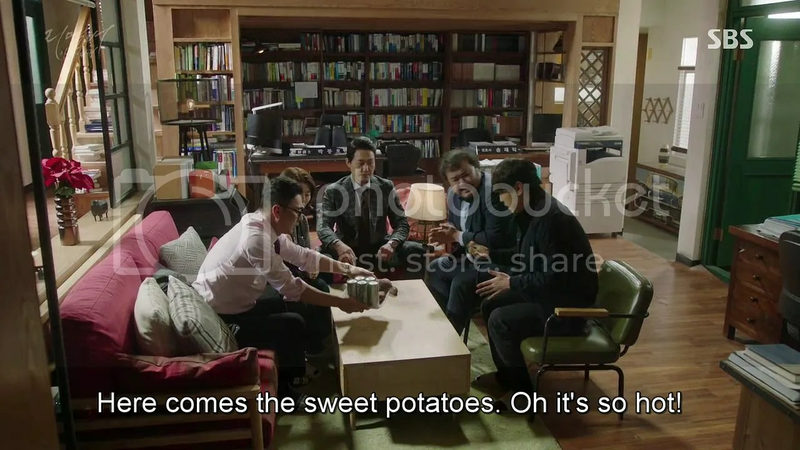 Soobum is there secretary/potato roaster and is on good terms with Lawyers Yeon and Song who’re still there too. 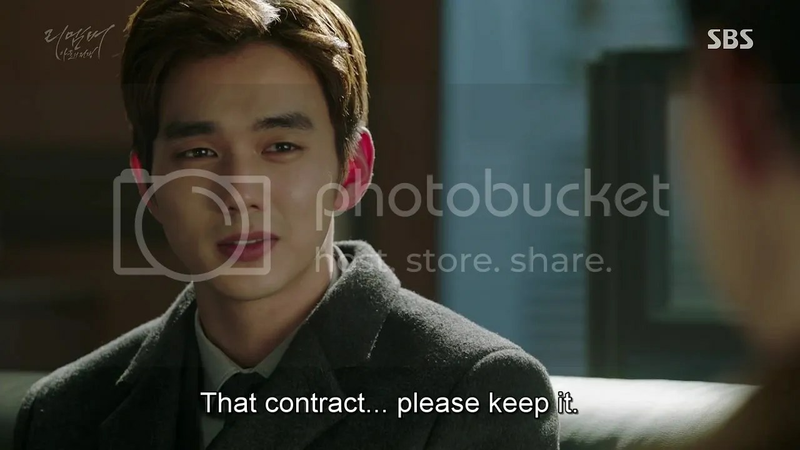 Dongho’s accepted sweet potatoes instead of money as payment for his case which irritates Lawyer Yeon given that they’re having a hard enough time paying rent as is without Dongho going pro bono all the time. Dongho scowls asking if they’ve forgotten what Byundoori stands for. The room gets quiet at that. Dongho flashes a year back to when Jinwoo asked him to honor their contract. He ruefully mused that he won’t be able to work as a lawyer anymore. (What am I supposed to do with all these feels?) Dongho says he can no longer be a lawyer who works for money. 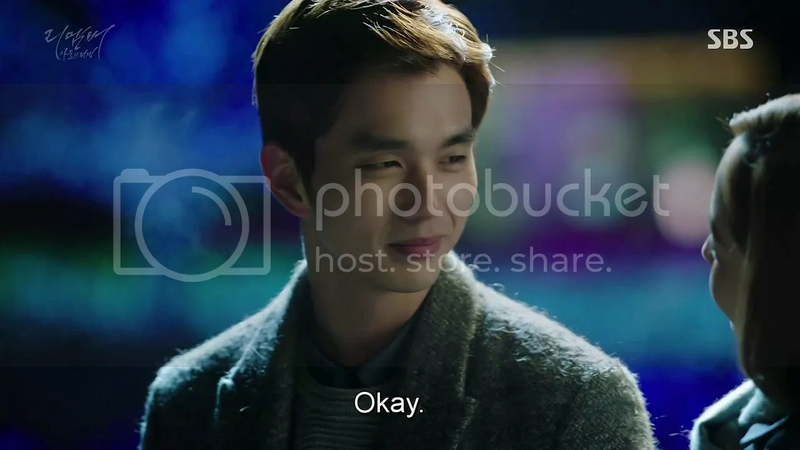 Lawyer Yeon and Jae Ik decide that they have to bring home the bacon then. 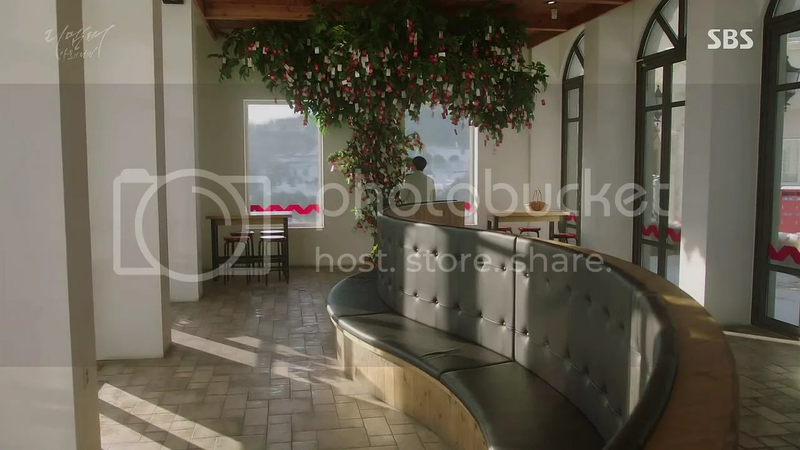 The atmosphere’s happy and friendly, just the sort Jinwoo would have wanted. We return to the tree by which Jinwoo and In Ah first kissed. Jinwoo’s there, sporting a new haircut and a quieter aura. He hangs a card on the tree and smiles. He turns to find In Ah behind him, tears in her eyes. He smiles and walks closer and closer. But passes right by her. She calls after him and he turns with a smile but asks who she is (That always stabs right through me). In Ah walks to the tree and reads the card he left. Jinwoo: Perhaps all the pieces of memory I have lost will be with you instead? Please keep those memories forever. I always pray for your happiness wherever I go. She tears up and runs after him. In Ah smiles through her tears as he turns to leave. 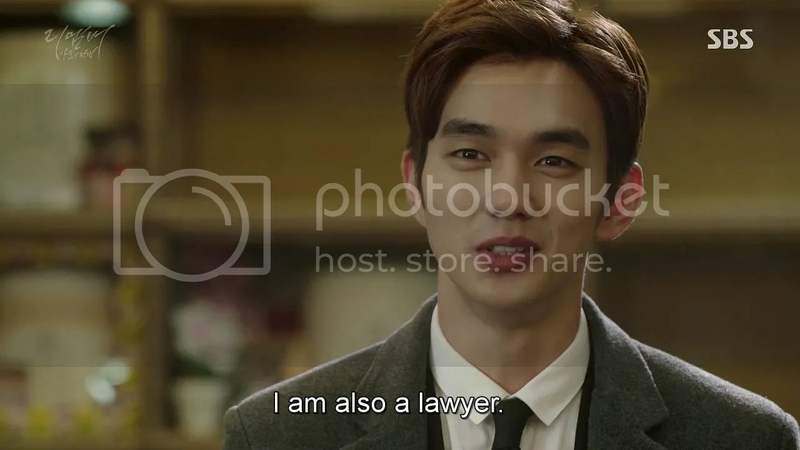 Jinwoo narrates as he walks: Once upon a time, I was a lawyer who was able to remember every single detail. They told me that absolute memory was a power and disability at the same time. Just because of that capability, I was blissful yet unhappy at the same time. Back at the Byundoori law firm, everyone watches Jinwoo’s separate parting message to them once more in tears, but Dongho manages a smile. Past Jinwoo: I really won’t be able to forget all the good times we had together. Thank you so much for allowing me to gain so many good memories everyone. And on a wistful and bittersweet note, in the present, Jinwoo finally thinks to himself that: the fact that I existed won’t go away even if my memory is gone for good. Behind him, In Ah smiles. What a journey it’s been, from a tale of fathers and sons, foster fathers and strange compansions, to greed, law and corruptions, to truth and justice winning over wealth and the law, to the story of one boy who loved his father and would have liked nothing more than to live a simple life for the rest of his days with him and the girl he loved. I could probably like more eloquently when I’m not crying, but it hurts to think that Jinwoo will not longer remember that journey and how instrumental he was in changing the lives of so many people around him. 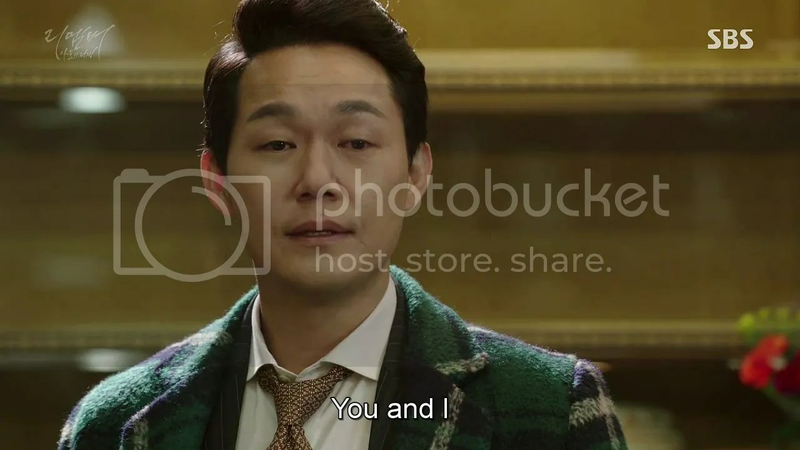 From Dongho, to Lawyer Yeon, to Lawyer Song, to Soobum, Il Ho, Gyuman, Hayoung, to In Ah. He’ll no longer have any memory of it. But I wonder if it won’t be for the best, if he might even find that freeing. Is he now able to live the sort of happy life his father wanted him to live? I don’t think so. He’ll merely pass from day to day remembering brief snatches of each, without anyone close by unless In Ah sticks with him like glue (which I think she will). But perhaps that is too pessimistic a take on his life. Perhaps all that matters was that he lived, loved and he fought, and for however long he has left, that’ll be enough. 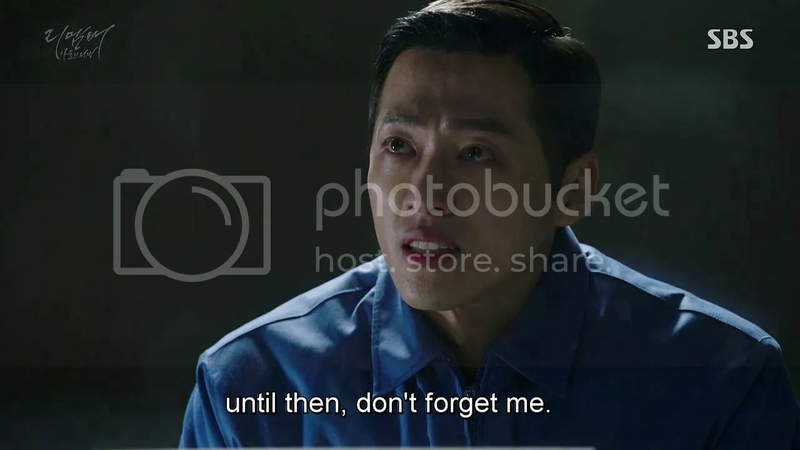 Kudos to the cast of Remember, especially Jung Kwang Ryul, Yoo Seungho, Park Minyoung, Nam Goongmin and Park Sungwoong for such an incredible job. Finally! All in all, it’s a great drama! 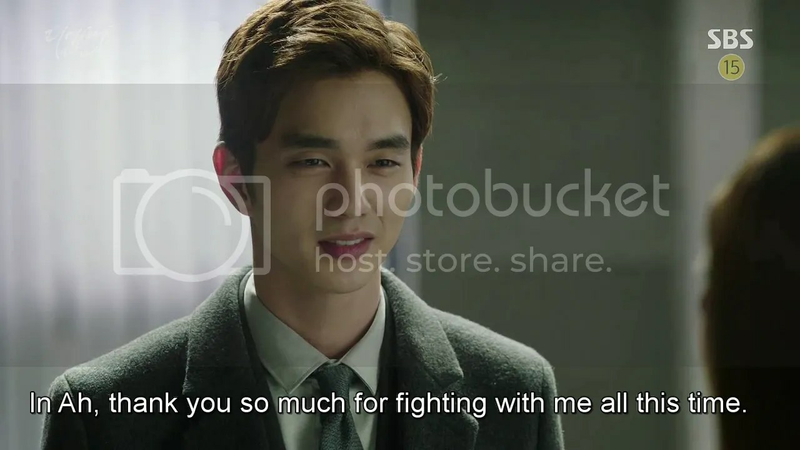 I really enjoyed reading your recaps and thoughts. Thank you so much! “Perhaps all the pieces of memory I have lost will be with you instead? Please keep those memories forever. I always pray for your happiness wherever I go.” that note was the saving grace for InAh, when hopes is all but gone. sometimes just one rope drop from the sky will suffice. To Inah, to know that while his memories are all but gone, he did remembered there is a “you” that he addressed to who will keep all the memories that JW knew he lost which are precious to him, and that he is seeking comfort daily to hold on to the belief that there is ‘someone’ (you) that will love him ‘forever’ by just holding on to the memories for her happiness. and to have someone loved you daily to pray daily, if not true love then what? i loved that you gave the hope that “In Ah sticks with him like glue (which I think she will).” you know thru out the whole 20 ep recap, that was the brightest sentence you should made, at least to me. why? 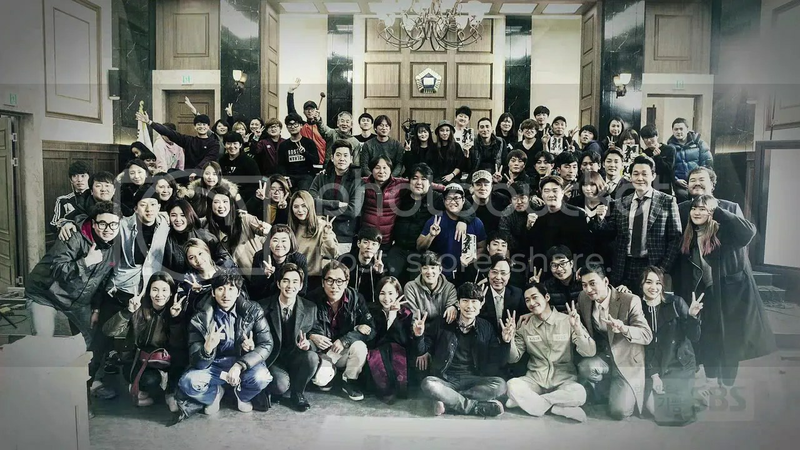 above ALL OTHER DRAMAS, this drama stand out as one that i loved dearly and yearned not to have sad ending of OTP partings, because the character of SJW is one that i have never ever witnessed so broken in my entire 16 yrs drama watching life, the last time i cried Red-Sea, was when i watch WinterSonata, nothing broke the dam in like manner till the tale of Seo Jinwoo. while i gave up craving over skinship or kissing scenes, i just want one thing from this OTP, let him have a respectable end, and both walking beside each until the life-ends. who should decide for IA what she wants, if she knew her costs, and want to want behind him, be his memory bank daily, and take joy in occasions when he recongised her. did not JW told her, “In your actions and eyes and heart, I saw how much you wanted to be by my side.” this pair of sincere eyes will melt his vacant cold heart and be filled with her memories and love one day. 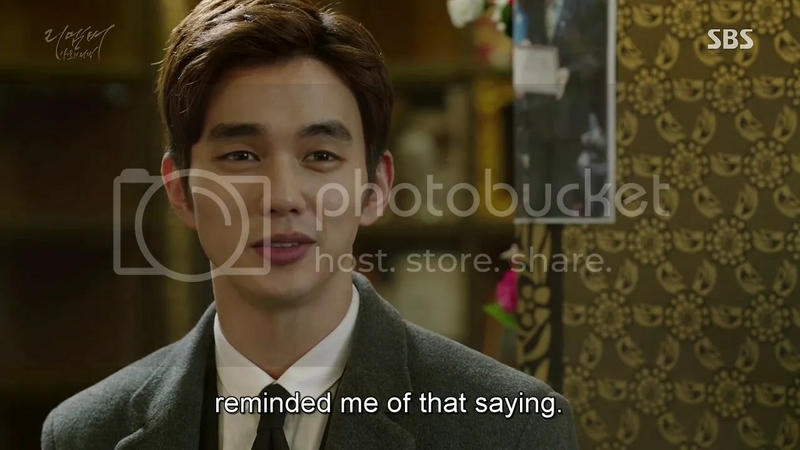 the initial intention of Writernim, in his Teaser, was InAh gave him back his pendent and said “i will be your memory”, which means from the Genesis of this drama been crafted, she should be written to stay and be his mind to restore memory, his heart to remind him the one in his note is her. i will never ever not remember this Jinwoo and his InAh. Alz’s is cruel, to have Alz in young prime age is double cruelty, to have Alz in young age and not written to have tasted love is ten fold cruelty, to have Alz in young age not tasted love and not written an ending with true love found by his side, is plain Hellish.